The Heckler & Koch MP5 is a 9mm submachine gun of German design, developed in the 1960s by a team of engineers from the German small arms manufacturer Heckler & Koch (H&K) of Oberndorf am Neckar. There are over 100 variants of the MP5 including a semi-automatic version. 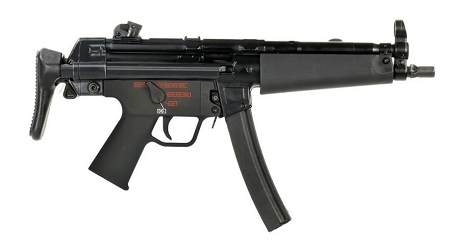 The MP5 is one of the most widely used submachine guns in the world, having been adopted by 40 nations and numerous military, law enforcement, intelligence, and security organizations.